UCF came onto the college football scene in 1979, with the help of second president Trevor Colbourn. 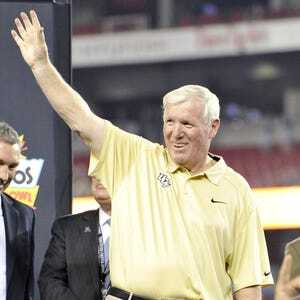 UCF came onto the college football scene in 1979, with the help of second president Trevor Colbourn. To lead the newly formed athletics department was Dr. John T. “Jack” O’Leary, the university’s inaugural full-time director of athletics. After 24 seasons as a Division I Football Independent, the Knights joined the Mid-American Conference as a football-only school starting in the fall of 2002. The excitement was beyond imaginable, as the Knights joined teams from seven states: Ohio, New York, Michigan, Indiana, West Virginia and Illinois. The rise to the MAC was highlighted by the impressive play of quarterback Daunte Culpepper, who brought excitement and helped put UCF football on the map. Culpepper led the 1998 Golden Knights to a 9-2 record, falling to only Auburn and Purdue. Culpepper not only headed the best football season to date, but also finished sixth in the Heisman Trophy voting that season. He also set a NCAA record with a completion percentage of 73.4 percent for the year. After his stellar junior season, Culpepper was drafted with the 11th pick in the first round by the Minnesota Vikings in the 1999 NFL draft, making him the Knights’ highest draft pick at that point in time. UCF’s first home contest against a MAC opponent would come against the University of Akron on Oct. 26, 2001, a season before they entered the conference. The Zips wanted to give the Knights a rude welcoming into their respected conference. The Knights used that statement as added motivation going into the much anticipated contest. Tempers flared even more when the Zips gathered at midfield on the UCF logo before the game. “The kids were already lit, but the flame went as soon as [Akron] went to the middle of the field,” said UCF’s head coach at the time, Mike Kruczek. UCF would go on to score a school record 50 points in the first half and defeated Akron by 57-17. The Knights proved that they were more than deserving to be in MAC and rudely kicked the door down, announcing their arrival. The Knights went 6-2 in their first year in the MAC and finished the season 7-5 overall, proving they belonged in the conference and that they could compete against most teams. In the Knights last football season in the MAC before UCF transitioned to Conference USA for all sports, the school made a controversial hire of Minnesota Vikings defensive coordinator George O’Leary as their new head coach in 2004. The hire was more scrutinized as the Golden Knights would go 0-11 in O’Leary’s first season. The losing streak was extended to 17 games over the course of three seasons as they entered the 2005 season, dropping the first two games of the season. Not expected to progress a whole lot from 2004, the Knights blasted onto the C-USA scene by winning their first conference game of 2005 against Marshall by a score of 23-13. The victory was major for the program, and fans celebrated at the Citrus Bowl by storming the field and tearing down the goal posts. The celebration continued on campus as students returned from the game to party in the Reflecting Pond. As if the team was propelled by the fanbase’s excitement over its first win in 18 games, the Knights remarkably went on to win eight out of their last nine games and finished with a conference record of 7-1 in its first season in C-USA. They secured the C-USA East division title and earned the right to host the first-ever C-USA Championship game, which they unfortunately dropped to Tulsa. Though they did not win the conference and lost their first-ever bowl appearance due to a missed extra point, the season was pivotal in establishing the Knights’ presence in the conference. In 2007, two big installments and a name change brought new culture and tradition to Central Florida. That year, UCF unveiled a new football stadium, Bright House Networks Stadium, and a new basketball arena, now the CFE Arena. They also dropped the “Golden” from their name and moved into the year as the Knights. The inaugural season of Bright House Networks Stadium saw the Knights go 5-1 at home, with their only loss coming by just three points to No. 6 Texas in their home opener. To go along with the stellar home record, the Knights went 9-3 in the regular season, earning them another chance to host the C-USA Championship game and another chance to defeat Tulsa. This time around, the Knights would prevail over the Golden Hurricane by a score of 44-25, earning them their first conference title and their first 10-win season in program history. They would go on to win two football titles in C-USA, with their second coming in 2010, giving them a berth in the Liberty Bowl against the Georgia Bulldogs. A low scoring 10-6 game against Georgia would land the Knights in the spotlight as they defeated an SEC team for the first time ever. The win, along with their stellar season, would give UCF a final ranking of No. 20 in the coaches poll. Knights’ basketball team finished 22-11 (10-6 C-USA), and the baseball team finished its season 45-17 (16-8 C-USA), making the NCAA tournament for the second time in the club’s history. As the Knights’ football season approaches, high expectations loom with new football head coach Scott Frost at the helm, the chatter of the athletics program leaving the American Athletic Conference for Big 12 expansion leaves a feeling of déjà vu, reminding avid UCF followers of their leap from Conference-USA to the AAC just three-and-a-half years ago. UCF’s radio play-by-play announcer Marc Daniels has been the voice for UCF sports since 1995, and he’s witnessed the program’s growth over the years. Following the Knights’ athletic prosperity toward the end of the program’s time in C-USA, he believed they played well enough at the right time, which resulted in a conference upgrade. Daniels has seen the program move from an independent trying to make a name for itself to AAC to Fiesta Bowl champions its first year in the league. He has also seen a football team go winless, the baseball team underachieve and a basketball team struggle to recover on the court from recruiting sanctions in a conference that he believes is more competitive than advertised. “When the American was formed, UCF came in as one of the anchor sports brands in the American,” Daniels said. “I think the American certainly benefited from that while the media was focusing on the collapse of the Big East. I think those that were going into the American felt that UCF was one of if not the bell cow athletic program of the conference. Although the UCF football program saw some consistent success after joining the AAC, the basketball team did not. Since joining the American, the Knights’ basketball team has disappointed many with a record of 37-54 (15-39 AAC). The basketball team seemed on the verge of reaching the same general success that the football endured prior to joining the AAC. In the 2010-11 season, former head coach Donnie Jones led the team to victories over No. 18 ranked Florida and Miami, leading to a 14-0 start and the team’s first-ever national ranking. But after UCF tried to reel in a commit illegally, it struggled to recruit players who would help them compete at a high-level in the AAC. Ware would eventually commit to play for the Knights, but it was short lived, as reports would surface of recruiting violations not long after. “It didn’t take long at all, and a month or two later after Kevin Ware committed to UCF the New York Times and ESPN.com, working together on the reporting, released a story about UCF’s improper recruiting, dealing with a runner named Kenneth Caldwell and how they were using him and his influence to help them recruit players,” Helwig said. The basketball program had a hard time being aggressive with recruiting, and Helwig believes that some of the struggles with the program stem from the dark cloud that hovered over them following the sanctions. Trouble also loomed in football this past season, one that saw a 0-12 record and the retirement of head coach George O’Leary, who had previously stepped in as interim athletics director after the departure of Todd Stansbury. He would later step down from the role, before ultimately retiring from coaching altogether. The new athletics director and new wave of coaches, however, have brought anticipation back for many UCF sports. Coming into this fall, there are new men’s and women’s basketball coaches, a new football coach, a new baseball coach and new men’s and women’s tennis coaches. Now, UCF is looked toward another conference change: a leap to the Big 12.